The sun is actually shining on Oregon today, and I'm in a bright citrus-y kind of mood! I saw this picture on one of my daily reads, Apartment Therapy's The Kitchn, this morning and had to share. Makes me look forward to spring and summer sunshine! 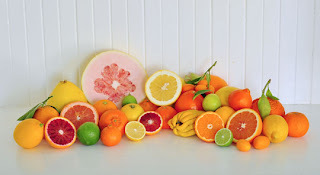 Check out the full article on California citrus here.